Use the Tool in the Bottom Frame for This Section! Visible light ranges from about 4,000 angstroms to 7,000 angstroms. In fact, the colors that make up visible light, like red, blue and green, also have their own ranges of wavelength. Take a look at the diagram below to see what these ranges are. Colors next to each other blend together, so the numbers are only approximations of where the spectrum shifts into the next color. 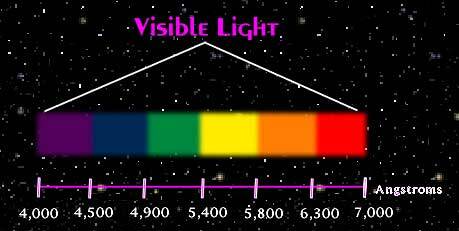 Remember, the numbers are telling you how long the wavelength of each type of light is. The light with shorter waves, like violet and blue, are more energetic than the light with longer wavelengths such as red. Look at the visible light spectrum above. At what wavelength does green merge into yellow? If a star is producing light that is 4,200 angstroms in wavelength, what type of light is coming from this star? As you increase this star's output to wavelength's that measure 5,000 angstroms, then 6,000 angstroms, at what point(s) does the star's light change colors? Can you make a guess at the wavelength that visible light coming from a "Red Giant" star falls into? Red giants stars can lose mass by blowing off material from their outer shells, as in the case of the M giant star HR 3126 (above), This material condenses as it cools to form dust grains very small in size. Here's some even tricker questions! What type of light besides blue blends into the violet part of visible light in the electromagnetic spectrum? (hint: it won't be visible light.) Use the tool in the frame at the bottom of the page below to put in your angstrom entry and find out. A neutrn star (above) is really dense star toward the end of its life. It's only 20 km in diameter, so its density is 10 to the 15th power times that of water. Its made of neutrons. When magnetized and rotating, they emit regular pulses of radiation and are called pulsars. If a neutron star is producing light that is 200 angstroms in wavelength, what type of light is coming from this star? As you decrease this star's output to wavelength's that measure 80 angstroms, then 4 angstroms, at what point does the light begin to shift into another type? What if a new star produces light that is 7,500 angstroms in length? What type of light would this star be producing? And, the final challenge! 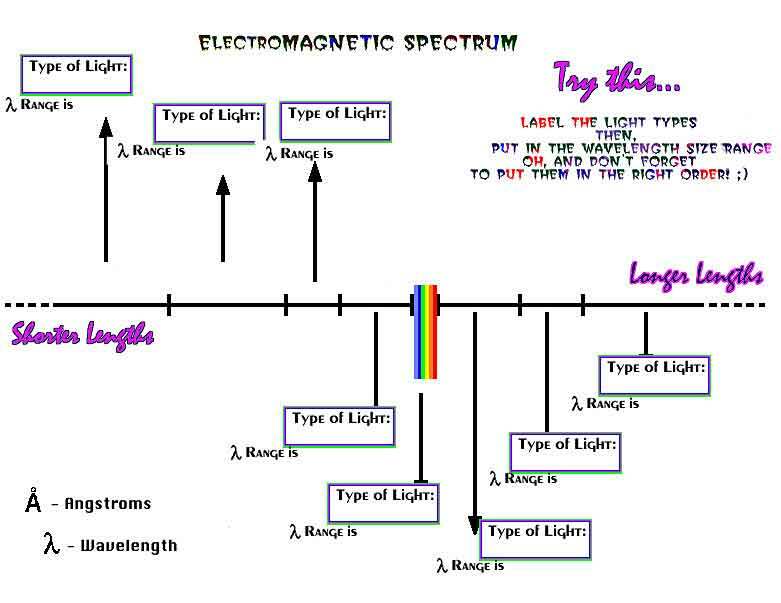 Can you find the numerical boundaries scientists use to distinguish between ALL the light types of the ENTIRE electromagnetic spectrum (x-ray, gamma ray, infrared, ultraviolet, radio waves, extreme ultraviolet, microwave, and visible)? of the Center for Extreme Ultraviolet Astrophysics Light Tour. We hope you enjoyed it and learned some things about the different types of light that make up the electromagnetic spectrum. All text, images, and other resources in this page are Copyright © 1996, The Regents of the University of California. All rights reserved. For permission, email outreach@cea.berkeley.edu.